I work from home and people often ask if I miss the human contact. Don’t I get lonely? Don’t I go stir crazy? I always feel a little weird answering that actually I don’t. It’s the truth, but I’m afraid it makes me seem anti-social – the crazy recluse. I never add that, as a matter of fact, I could use even more alone time. Extraverts feel energized after hanging out with other people. 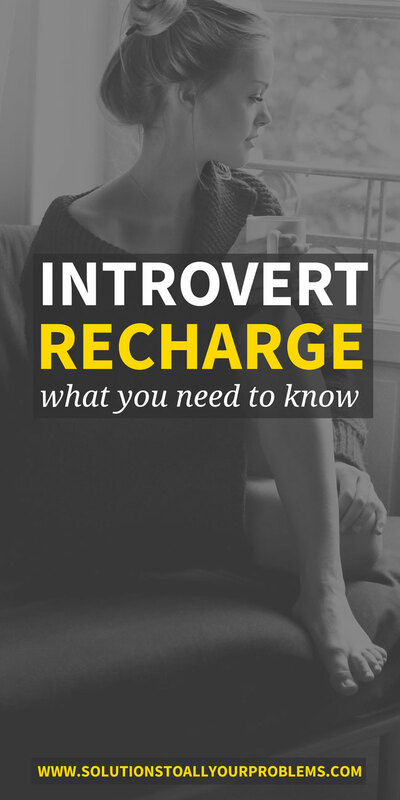 Introverts get their energy sapped by other people and need time alone to recharge. But it’s a little more complicated than that. Not all alone time is equal for introverts. What you should really be looking for as an introvert is time for your brain to process things. This may play out a little differently depending on your other personality traits and depending on your specific situation, but here are a few examples from my own life to clarify the distinctions between different types of alone or recharging time. I telecommute and I’m often the only person in the house for several hours a day. However, my work involves a lot of interaction with people via phone and email. Interactions via phone drain me nearly as much as being in the same room with someone. Email is not as draining, but it’s definitely not recharging either. Basically, as long as I’m interacting in one form or another, I’m not recharging. Another thing my work requires is focusing my mind on whatever tasks I’m given. I often have to force my mind to think about things it’s not particularly interested in thinking about. Again, I may be physically alone when this happens, but if my mind is not free to process what it needs and wants to process, I’m not recharging. What introverts really need is free time for their brain. My husband is someone I’m very comfortable with and someone who knows that I need quiet in between talking. So I can be doing tasks with him (say, painting a room) and we can exchange a few words here and there, but it can still be a recharging activity because my mind is mostly free. How do you know if you are getting enough recharging time? I’ve looked and have not been able to find any guidelines for how much alone time should “do it” for the average introvert. My guess is that it varies from person to person as well as from day to day for any one person. It’s easy to tell when you have not had enough though. You are probably tired, cranky, and have a short fuse. You may not be thinking clearly and have a hard time “playing along” in a social situation. When my batteries are completely dead – i.e. when I’m totally overstimulated – I usually also get a headache. But ideally, you would never let yourself get to that point. The longer you let yourself go without recharging, the longer it will take to recover. And the more draining an activity, the longer it will take to recover. The key is to learn to listen to your own needs and give yourself little breaks before you end up in that zone where your batteries are dead, crushed, and buried. I personally need at least two or three hours a day. That’s the bare minimum and I think something like eight hours a day would be ideal. Are you an introvert? How much recharge time do you need to feel your best?